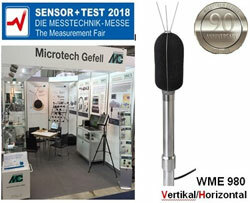 Microtech Gefell GmbH: MTG presents at International trade fair exhibitions, new high end Microphone solutions from the in-house Research and Development Department. Traditionally, visitors to the MTG stand will once again have the opportunity to get information about the latest technologies and developments in the field of acoustic Microtech measurement technology. With 569 exhibitors from 29 nations the SENSOR+TEST 2018 imposingly presented the entire spectrum of measuring and testing systems of all branches. The fair is also one of the world's most important scientific forums.